As Wesley Chan puts it, he was working at Google when there were still doors for desks, dogs running wild, and tarps covering the computers to ward off leaks from the roof. These days, he’s working on scrappy startups again—but this time, it’s as a partner at Google Ventures, based at the company’s Seattle campus. In between, Chan has worked on some huge products for Google. He was the lead on both Google Analytics and Google Voice, fostering those projects from early idea through buying the startups that would help push the projects to Google scale in a short period of time. According to “In the Plex” author Steven Levy, Chan was also responsible for an awesome cloak-and-dagger nixing of a possible Google deal to buy Skype. 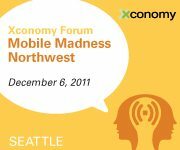 That mix of experience gives Chan a really interesting high-level perspective on where mobile innovation is headed, and that’s why I’m really excited to introduce him as a panelist for Mobile Madness Northwest, our half-day forum Dec. 6 at F5 Networks in Seattle. The special Early Bird rate expires today, so act now to get the best price on your tickets. In the mobile sector, his investments range from infrastructure companies like Crittercism and Parse to consumer applications like Astrid and Echoecho. But no matter what the startup is tackling, there’s one thing Chan says he looks for in an investment: the strength of the team. Yes, you hear that all the time these days, particularly since the shortage of technical talent has reached frantic levels. But Chan says that’s always been his approach, dating back to his product days inside Google when he acquired San Diego’s Urchin Software (the foundation of Google Analytics) and Seattle’s GrandCentral Communications (which became Google Voice). Those projects showed how small groups of talented people with the right backing could do something huge, even when others thought it wouldn’t be possible. Google Analytics, which injected the search company into enterprise software, was developed with only about 10 people. Google Voice, which attacked the carriers by piling up deals from international carriers, was done with about 14 people. Technical talent: Chan’s a coder, and went through the famously intense Google hiring process early on, so it’s probably no surprise that he looks for a very strong technical team, with one or more technical co-founders. Hustle: An insatiable appetite for building the business can get a lot done with very little resources. Chan says he saw this play out when developing Google Voice, particularly in the person of Grand Central’s Craig Walker. Expertise: Know what you’re talking about—or have the ability and drive (see above) to find out fast. It’s pretty cheap and quick to start a software company these days, but you won’t have success—or at least, you won’t get Chan’s attention—if you’re not deeply involved in the industry your startup is trying to target. That’s a taste of what you’ll hear Dec. 6 at Mobile Madness Northwest, and there’s plenty more. But you have to buy your tickets now to get the Early Bird rate, so don’t hesitate. And check out this recent interview with Charlie Kindel, a former Microsoftie who’s now tackling his own startup along with angel investing—we’re pairing these two for what should be a really awesome panel discussion.